Crater Lake looks spectacular in snow. Updated 04.01.2019: When Alan and I were planning a last-minute Crater Lake trip for late May, we should have known something was up. 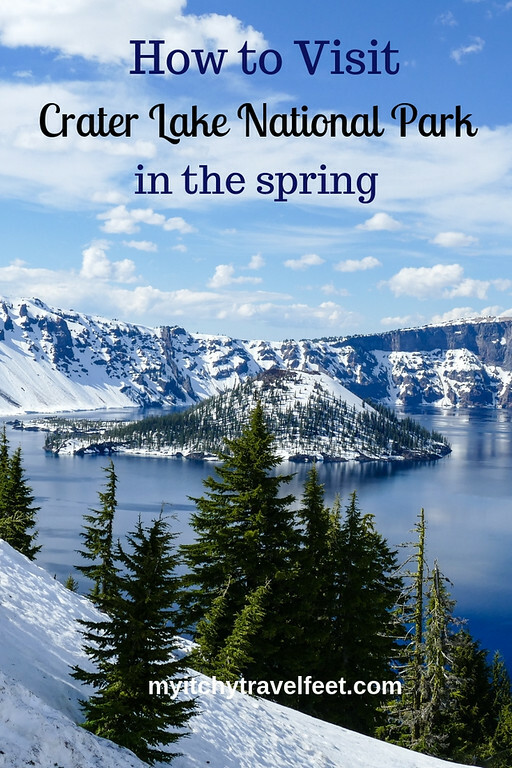 Three nights at Crater Lake Lodge in southern Oregon’s Cascade mountains? Score! Have you tried to get last-minute reservations at a national park lodge? It’s almost unheard of. Why was Alan able to snag the last available Crater Lake lodge room? In a word—snow. The Rim Drive that encircles America’s deepest lake doesn’t usually open until early July, especially during a year of heavy winter snow. This leaves spring visitors with beautiful views but less to do than on a summer visit. But, even though activities are limited, visiting Crater Lake in May offers special opportunities that you won’t experience in the summer. The lack of crowds more than makes up for fewer things to do. And active boomer travelers can still find a national park adventure or two, especially if you like snowshoeing or hiking surrounded by a beautiful white landscape. Squint really hard and you’ll see the roof of Crater Lake Lodge in this stunning scene. 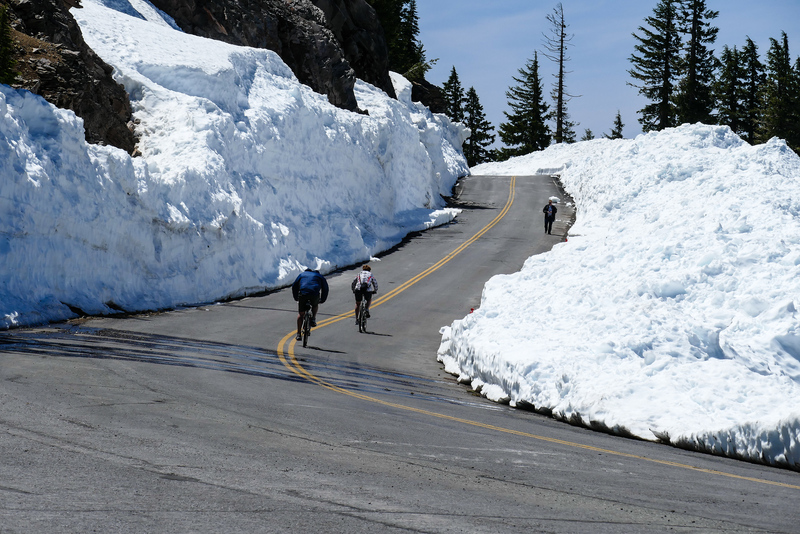 During the summer, access to Crater Lake National Park includes the North Entrance from Highway 138 near Diamond Lake, the South Entrance from Highway 62 near Klamath Falls and the West Entrance on Highway 62 from Medford. But when the Rim Drive is still snow-covered, the South and West Entrances offer the only access to Crater Lake. 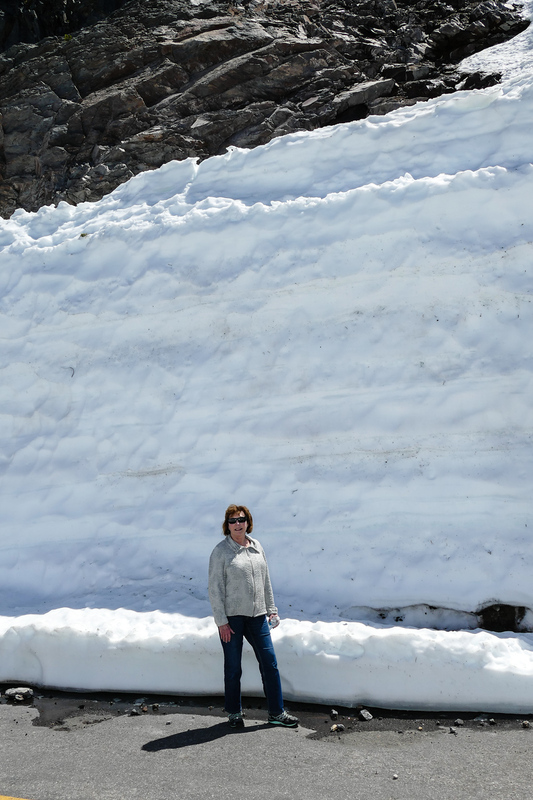 Surprisingly for an area that receives so much snow, the 3-mile road from the Visitor Center to Rim Village at the lip of the lake is open year-round. But you won’t have any place to stay in winter, as lodging is seasonal. 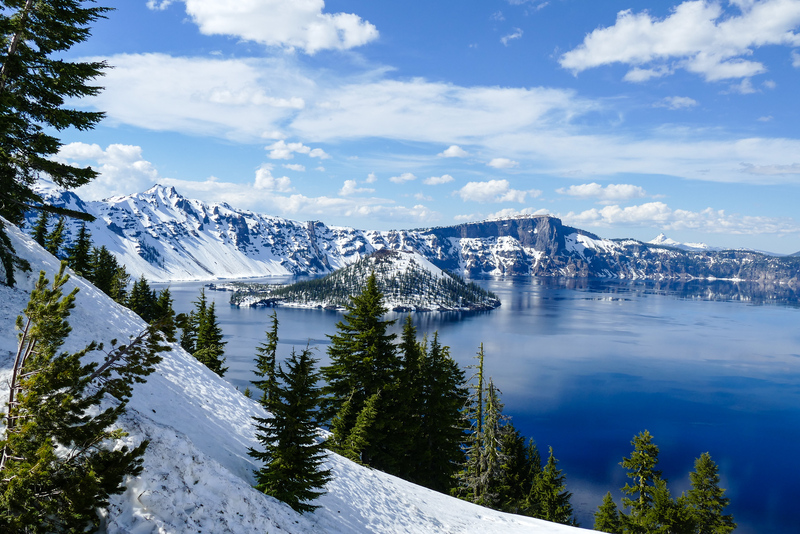 Although we couldn’t drive the entire Rim Drive, seeing Crater Lake National Park dressed in snow is a spectacular experience, as well as a fun photography challenge. The lake is actually a caldera left from the collapse of the volcano, Mount Mazama, about 7,700 years ago. Rainfall and snow make up the pristine waters of the lake. During our May trip, we lucked out with crystal clear weather and cornflower blue skies. 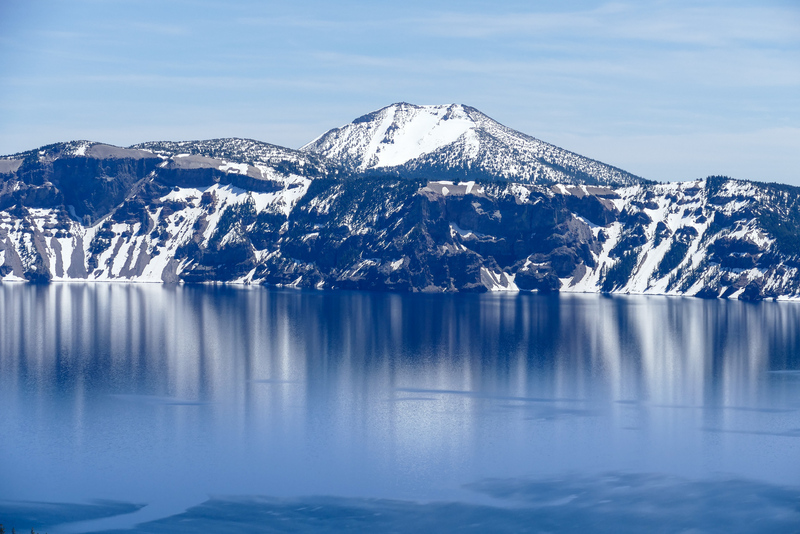 However statistics show that Crater Lake weather in May can be cloudy with limited visibility of the lake (due to clouds) 20% of the time, although that decreases to 10% in June. Walking along Rim Drive while it’s closed to vehicular traffic is a must! Although snow covered the ground on our visit, making hiking trails inaccessible, we still found plenty to do: photographing Wizard Island—the cinder cone in the lake—from about every angle possible, watching sunrises and sunsets from rocking chairs at Crater Lake Lodge, and staring at the incredibly tall snow banks on the sides of the roads. During our visit the Rim Drive had been cleared about a mile to Discovery Point. Plenty of cars pulled in and out of the parking spaces to photograph yet another perspective of this beautiful Oregon lake covered in snow. From this point the road was open to hikers and bicyclists for several more miles. Walking a portion of the Rim Drive without vehicular traffic is not-to-be-missed. But there are no restrooms available, so keep an eye out on possible bush break locations. With snow crowding the sides of the road that can be a challenge. All total, Alan and I walked a six-mile-round trip from Crater Lake Lodge to our turn around point on the Rim Drive. Hardy hikers carry snowshoes with them to access the unplowed portions of the Rim Drive. If you don’t have any, Rim Village provides snowshoe rentals. The rangers at the Visitors Center or the staff at Crater Lake Lodge also offer advice about other trails to snowshoe. Of course summer activities include waterfall hikes, drives on Rim Drive or a boat ride on the lake. The boat dock is accessed by a 1.1-mile steep trail at Cleetwood Cove. I recommend purchasing tickets ahead of time. That’s one tall snow bank! Be sure to dress in layers. If the sun is shining brightly, the temperatures rise quickly. We were comfortable hiking in jeans and windbreaker jackets. But on a colder day, I would have chosen to wear light thermals underneath safari pants topped off by a fleece jacket. The view from our room. See what I mean about the parking. 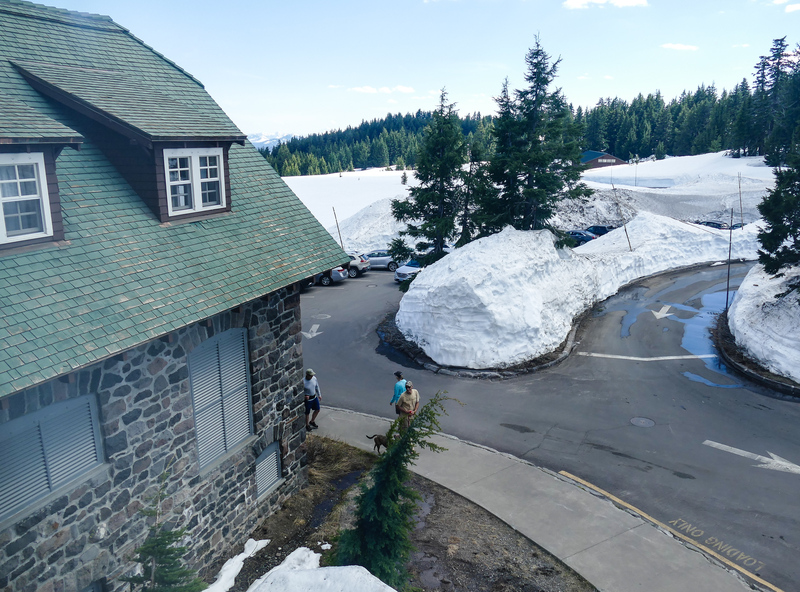 The 102-year-old Crater Lake Lodge opens about the third week of May and is the only Crater Lake lodging available in the park until Memorial Day. Designated a Historic Hotel of America, the lodge underwent an extensive renovation in 1995, which means that Crater Lake Lodge rooms are fairly modern, albeit without phones or a TV. The lodge offers complimentary wifi to guests but the connection is mediocre at best. However you’re here to experience Crater Lake not talk on the phone or watch TV. Alan and I especially enjoyed the Great Hall, which has plenty of seating, a rock fireplace and twice-daily ranger talks. Light meals and alcoholic beverages are available after 3:00 p.m., offering a break from the menu in Crater Lake Dining Room. 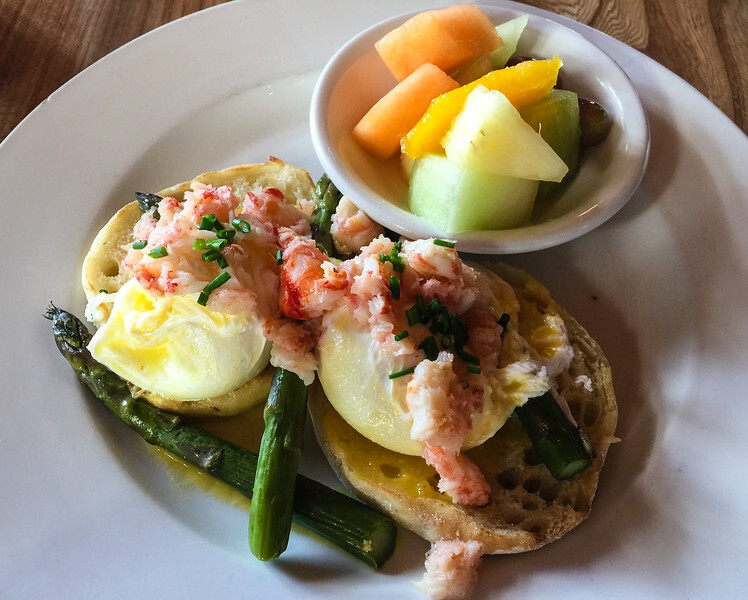 I highly recommend the crab benedict before heading out on a Crater Lake adventure. But plan for at least one dinner in Crater Lake Dining room where windows overlook the lake and the service is first rate. Although pricey, the emphasis on Northwest cuisine featuring Oregon products results in a fresh, tasty meal with a view. Servings are extremely large so consider sharing an entrée (there’s a small charge to share). Alan and I also enjoyed breakfast here as well as a lunch. Boomer travel tip: Dinner reservations are suggested, especially during the summer. A word about parking: with snow covering most of the parking spaces at the lodge, parking is limited. Once you find a space, you’ll be reluctant to leave it, which is why we didn’t drive back down the mountain to hike in lower elevations where the snow had already melted. Three nights at Crater Lake Lodge in May is probably a little too long unless you’re a die-hard snowshoe enthusiast. Spending two nights at the lodge to hike the Rim Drive or photograph the lake still leaves time to relax in the Great Hall. Not a bad way to experience Crater Lake National Park.